What exactly is a microscope rack stop? The microscope rack stop was created to protect the microscope objectives from hitting the stage. It is often easy when looking through the microscope and focusing, to be unaware of how close the microscope objective is to the stage (or glass slide on the stage). Before the microscope rack stop was invented, objectives were sometimes damaged when they hit the stage. 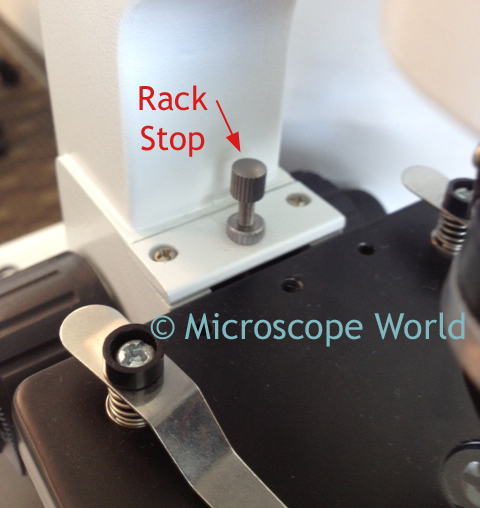 Rack stop shown on the MW2-HD1 digital kids microscope. The rack stop is a small screw that does not allow the stage to move too close to the objective lenses, and keeps the microscope slide at a safe distance from the objectives. The rack stop is set by the factory when the microscope is manufactured. It is occasionally necessary to adjust the rack stop. For example, if you were using very thin microscope slides, you might not be able to get the objective lens close enough to your specimen in order to focus properly. 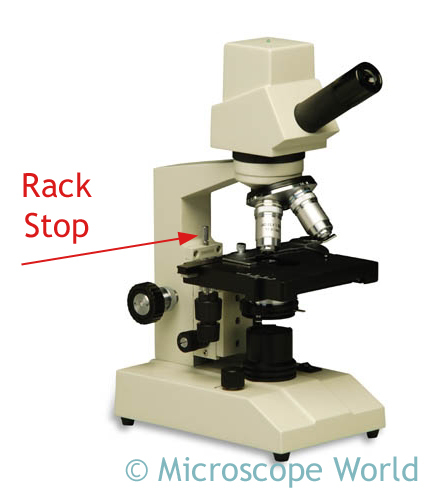 In this instance, the rack stop would need to be adjusted so you could focus the microscope and get a clear and crisp image. Adjusting the rack stop simply involves adjusting the screw so it is either higher or lower and will allow the stage to move more or less in one direction. If you adjust the rack stop on your microscope, make sure you test the focusing mechanism before looking through the microscope, so that you do not accidentally damage the objective lenses.